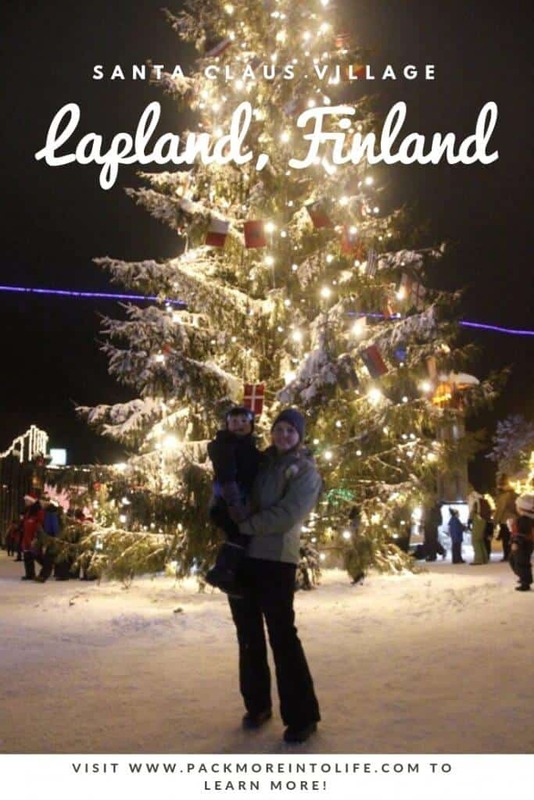 Our Lapland holidays with kids guide is meant to give you insider tips and top things to do. We will share where we stayed, where we ate and what we did with our then 3-year-old son! I’ll also give you tips on what to wear in the winter weather. We booked our trip for mid-December. 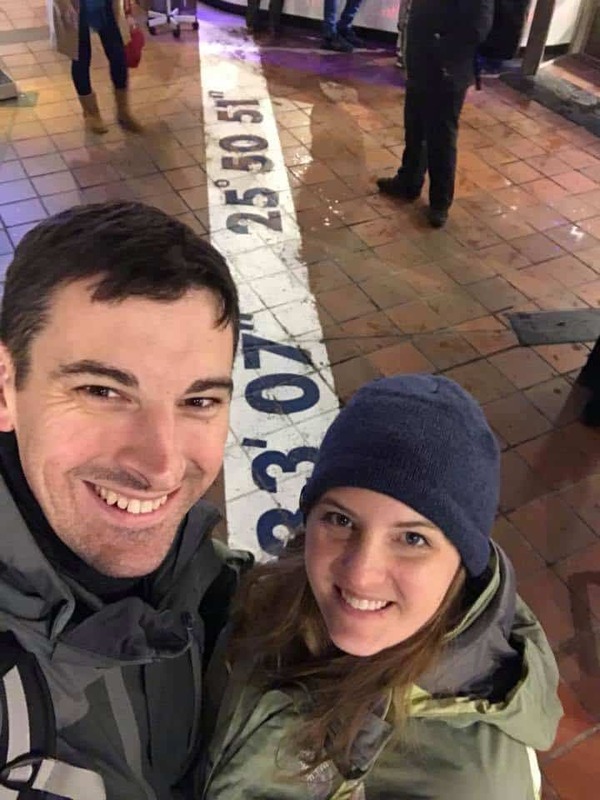 It allowed us to get slightly cheaper rates when compared with the Christmas/New Year’s season, snow was guaranteed (which meant the dog sleds would be operating) and the flights were cheaper. We flew from Munich, Germany (which meant we were able to enjoy the Munich Christmas markets) to Helsinki and then onto Rovaniemi. 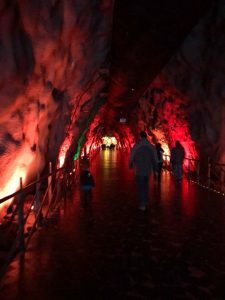 For our return, it was cheaper (and more fun) to take the Santa Claus Express Train from Rovaniemi to Helsinki, spend the day in Helsinki and then fly out back to Munich. We finished the drive back to Stuttgart where we lived. Finland is cold! 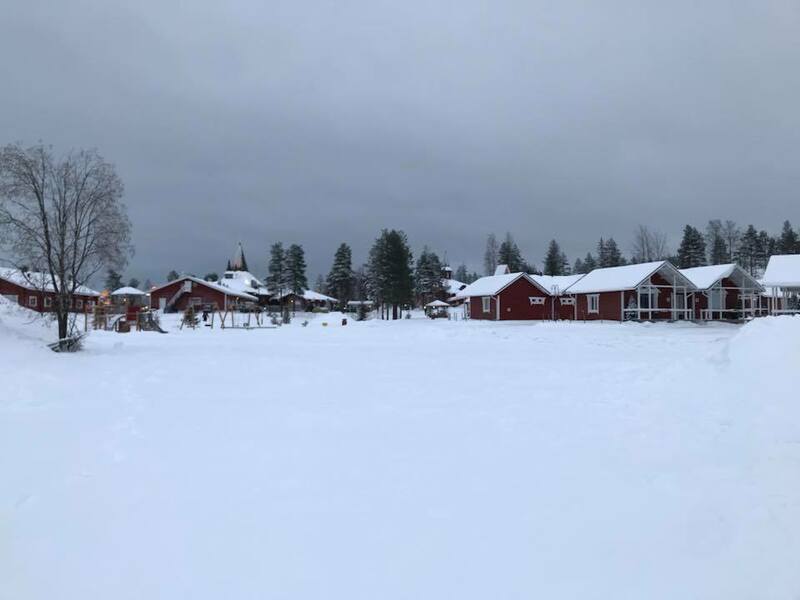 It’s up by the Arctic circle and temperatures can range from above freezing to below freezing. Honestly, the temperature doesn’t feel that much different once you pass the freezing level. You’ll need to pack lots of layers. Quality snow gear is essential. If you aren’t sure how to dress for winter weather, I’ve got a whole blog post to help you out. If your not sure how to mash all the winter gear into a few bags, I can also help you out with using packing cubes and more on this blog post: Travel Packing List Tips. We decided to stay at the Santa Claus Holiday Village. I sent an email via their website and they responded with the cabin types that were available for the dates in December that we were considering. They have two options, a classic cottage, and a superior cottage. The superior cottage includes daily cleaning, luggage handling, and slippers. You can also select to have a cottage with a separate bedroom instead of a studio style. We picked the classic cottage because the extras weren’t worth the cost for us. The price is based on two adults, you’ll pay extra for children or adults using the sofa bed. They also required half board during the Christmas season (which starts at the end of November). More on this later…. It was around 350 euro per night for Christmas season with half board for our family in 2017. You can also book via booking for the Santa Claus Holiday Village. Great if you are a frequent traveler and have received a discount voucher. It is also nice to check the pricing compared to the offer that the reception desk makes directly. Did we like where we stayed? We really loved the location! We were right next to the Santa Claus attractions and we could walk back to our cozy cottage after playing in the snow. It was a studio style with two twin sized bed for my husband and I and a pull out sofa for our son. There was also a little kitchenette with basic supplies and a table for 3. There are plenty of cabinets to store your gear and the bathroom has a sauna! Perfect for warming up and combatting any cold. It is a duplex style, so you walk into the front door into an entryway, then there is a door to the left and a door to the right. It’s nice to be able to keep your winter gear and wet boots just outside the door in the entry. They also leave a broom and shovel for clearing off the snow. Next to each cottage is a parking space with a plug to keep your car battery from dying in the bitter cold. We rented a car, so this was much appreciated. What we DIDN’T like….. the food. Is was awful! Breakfast was fake eggs that tasted like watery rubber, fruit from a can and thin waffles that you have to wait in line to make. The early bird gets the better of the options, but honestly, it was packed and not great quality. I wish they wouldn’t force you to pay for 1/2 board. The dinner wasn’t much better. There was a salad bar and then you could order from the 3-4 items on their fixed menu. My husband and I would always order something different. It was hit or miss. Nothing was amazing. The food is really the only negative for the whole trip. I hope that they read the TripAdvisor reviews and make some changes. *There was an option to upgrade our meal plan and eat in the restaurant, but when I looked at the price increase, it was a lot. If you have the budget and want to stay in the cottages, I would upgrade. You can order off a traditional menu and the quality looked much nicer. We flew in from Germany and arrived the night before, so this will be our first full day at the Santa Claus Village. We decided to rent a car from Hertz at the airport. You don’t have to rent a car because the Santa Claus Holiday Village offers free pick up from the airport (a 10-15 minute drive). However, we wanted to do a bit of Northern Lights chasing and be able to visit an Arctic zoo. Since my husband is from Alaska, we knew driving in the snow wouldn’t be an issue. If you want to rent a car, check out Europcar for the best deals. We’ve used this company many times of the years and they are wonderful. We always get great deals and support. Since we were staying in the village, we had free use of the sleds. There is a sled sitting outside each cabin, but be careful, they are taken often by tourists visiting for the day. We had breakfast and then headed over to a sled hill. It’s easy to find them throughout the village area since the snowplow frequently clears the village roads and piles the snow up at the ends of the streets and in the large field. We made some modifications and then had a blast. There are lots of open places to play with snow hills everywhere! It was peaceful in the village, especially if you walked just beyond the cottages. We visited in early December to avoid the higher Christmas season rates, but all the cottages were still booked. Nonetheless, we typically had an entire sled hill to ourselves. After a morning playing in the snow, we headed into the village to explore. It is just a short walk or sled ride. Here is a link to their map to help get an idea of where the cabins are in relation to the village. 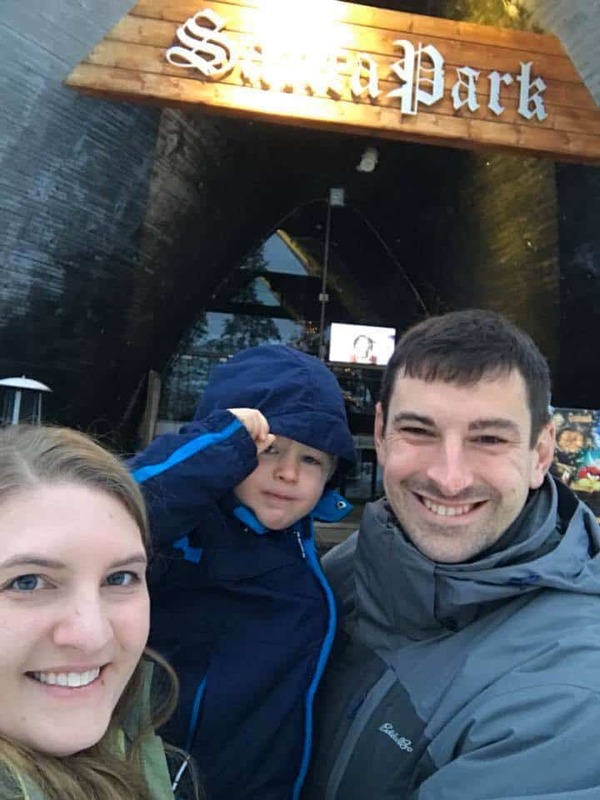 We decided it was time for a nice lunch, so we walked over to the Santa Claus Reindeer Park and ate inside the teepee. The food was amazing and the ambiance was excellent too. It was also kid friendly. 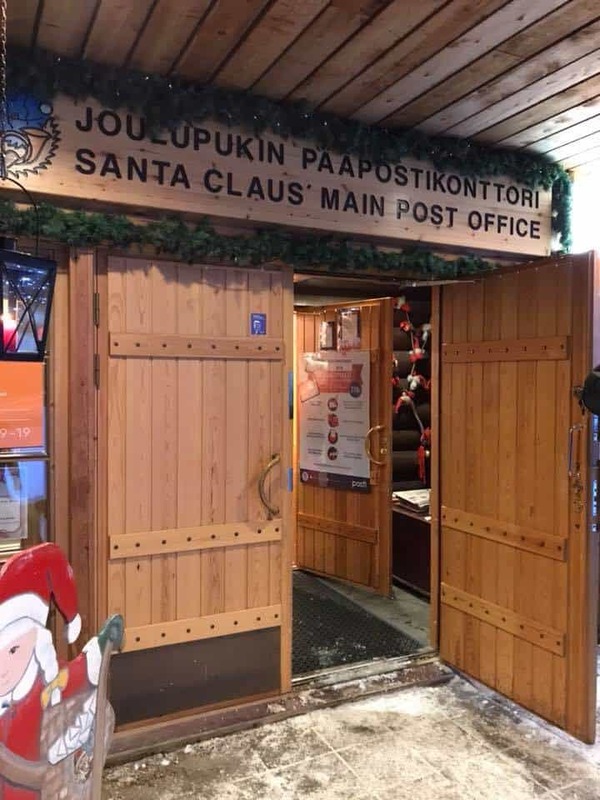 Next, we headed over to the Santa Claus Main Post Office. 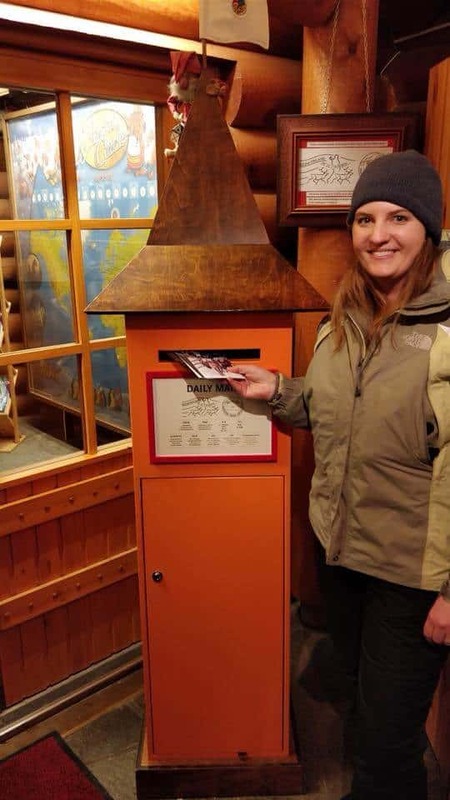 This is where you can buy postcards, write your letters, buy stamps and mail them with a stamp from the arctic circle. Make sure you have everyone’s address! Then when you are done writing them and you’ve purchased your international stamps, pop them into the mailbox! Our little one was getting tired, so we headed back to the cottage for a quick nap. Another bonus for staying in the village! My husband was great and stayed in the cabin while I enjoyed a bit of shopping in the gift shops. When everyone was ready for more fun, we went off to see if Santa was available, but the line was a bit long, so we decided to check back again later. TIP: Go early or go late to see Santa. Otherwise, the line can get long and that’s never fun. It’s easy to circle back and check the line often throughout the day. We ended up visiting an hour before it closed and waited maybe 15-20 minutes. We took photos by the Arctic circle line, played at the playground (which is an adventure when everything is frozen) and admired the lights. 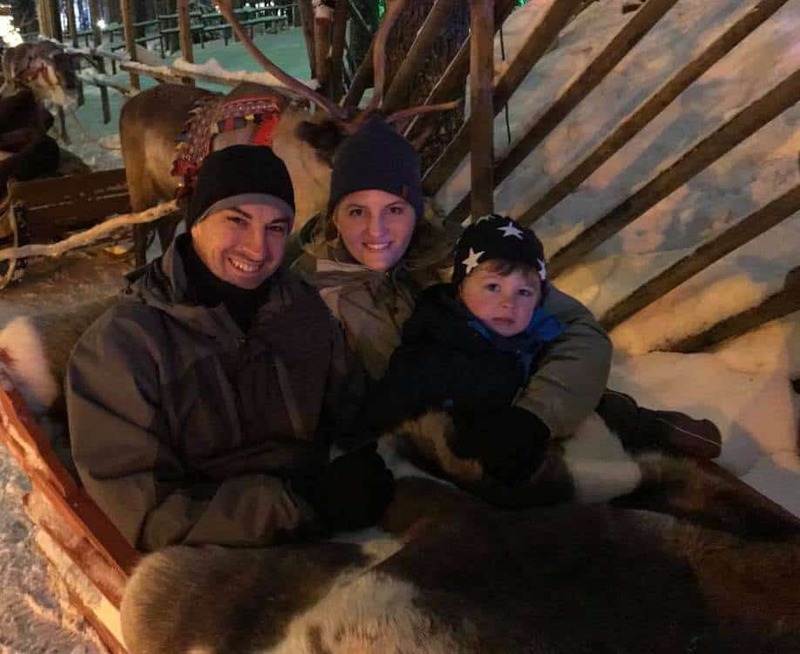 Then it was finally time for our reindeer sleigh ride! There are so many options, but since we knew we would be at the Santa Claus Holiday Village, we picked the Santa Claus Reindeer Park. They have 3 different options and a nighttime tour (Northern Lights Tour), so you can pick what works best for you. 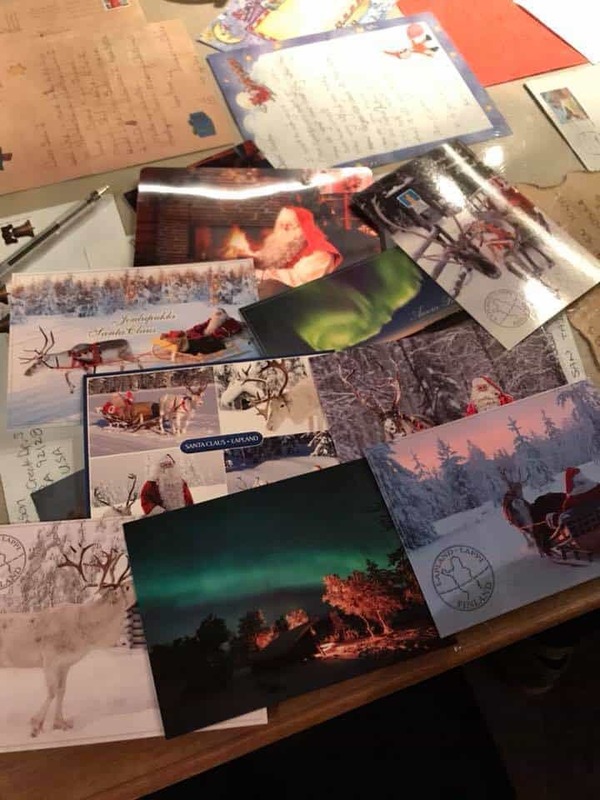 Read more in-depth about our Reindeer Sleigh ride here. The reindeer sleigh was so peaceful through the beautiful finish forest. If you want to experience what is it like, view our short video below. After our ride, we headed back over to the Santa area. 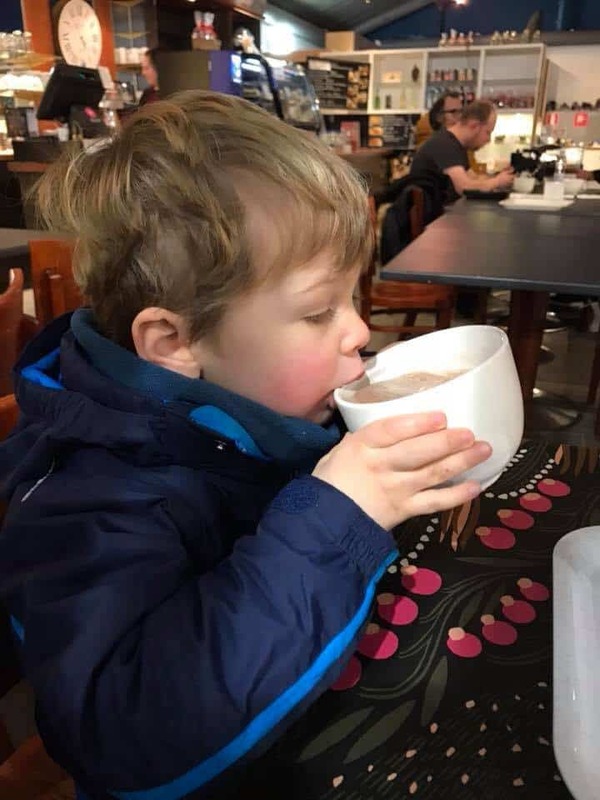 There is a small restaurant with delicious hot chocolate and treats. 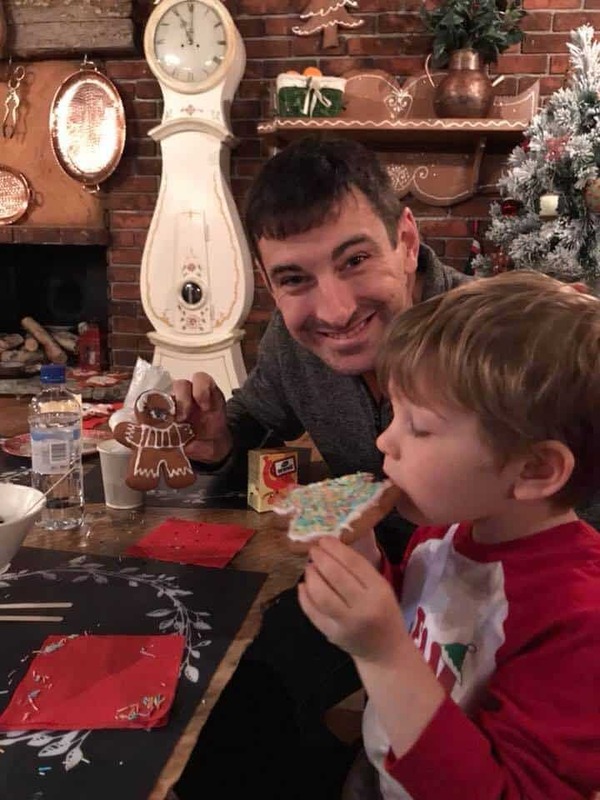 It was a great little break and helped to perk up our son before we went to visit Santa. Finally, it’s time to visit the big man himself….SANTA! TIP: There are two different Santas near each other. You don’t want the Santa Claus inside the building where you get breakfast and dinner. It is closer to the road and parking. I’ve heard he isn’t as great and people are disappointed to spend the money and then realize the “real” Santa is actually tucked back into the village. When you look at the map, Santa is located in the Santa Claus Office. There is a large steeple roof and no parking nearby. When you enter, go straight and you’ll find the line and entrance just on your left. You’ll walk through a fun little path, up the stairs and up to a balcony. Before you enter you’ll see a little desk. This is where you can buy a little something for Santa to give to your little one. I did this on the sly while my husband entertained my son. I ordered him a little bell. You’ll pass a ticket to the elf in charge before you enter and she will make sure everything is all set for you. Then they open the door and in you go! Santa really takes the time to talk to you and talk to your child. Sure, I was disappointed that it isn’t his real beard, but everything else is very nicely done. You will take a family photo for a quick minute and then continue on with your visit. Santa presented my son with his gift (that we purchased earlier) and he even explained a bit about the magic of the reindeer bell. My son was certainly smiling from ear to ear! I loved how much time Santa spent with our family and how friendly he was. He is an amazingly patient man to meet with so many children each day. You can purchase a video and photo package at the end of your visit. We thought the family photo turned out really nicely. If you want to see the quality of the video, check ours out below. It was a packed day at the village, so after our visit with Santa, we headed off to dinner (included in our stay) and then off to bed. After our first day spent in the park and outside in the snow, we decided an inside day would be best. We hopped into our rental car and drove just down the street to the Santa Park. This is different from the village. It is an indoor theme park of sorts that is completely related to Christmas and all the cheer that surrounds it! The Santa Park is inside an old bunker. You’ll be able to tell when you descend down a long wide hallway and past a set of huge blast-proof doors. Once you pay and enter the park, you’ll see a series of hallways with different activities. In the center is the main stage with a nice show and a place to buy food. We thought the buffet lunch was quite nice. Elf School: We really enjoyed this activity. Make sure you make note of the times when it takes place. You’ll gather in a hallway and the elves will explain that you’re going to Elf school. They ask the audience about the languages they speak and our group was a mix of English and Finnish. 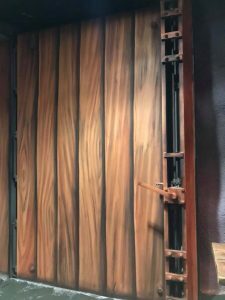 Then they open a secret tunnel that leads into the elf school area. So cute! We crept through the tunnel and found some seats on wooden stools. The elves taught the kids how to become elves and it was very interactive. Once we all graduated, we were given certificates and let back into the main hallway. 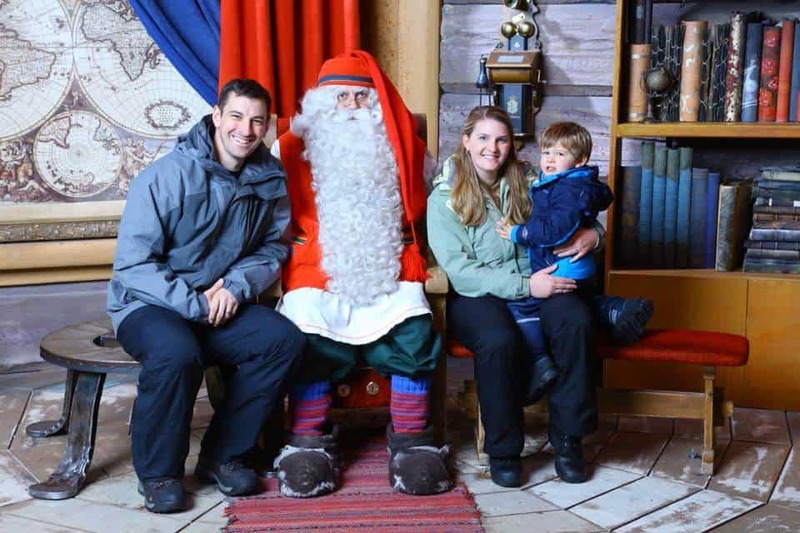 Santa’s Office: Another opportunity to visit with Santa. We told our son that Santa likes to be close to where Brayden is and loves to visit with him as much as he can. They will also let you take photos if you’d like, or you can purchase a photo after your visit. Post Office: We explored the old typewriter and saw postcards, but didn’t purchase any since we had already mailed our postcards the day before. 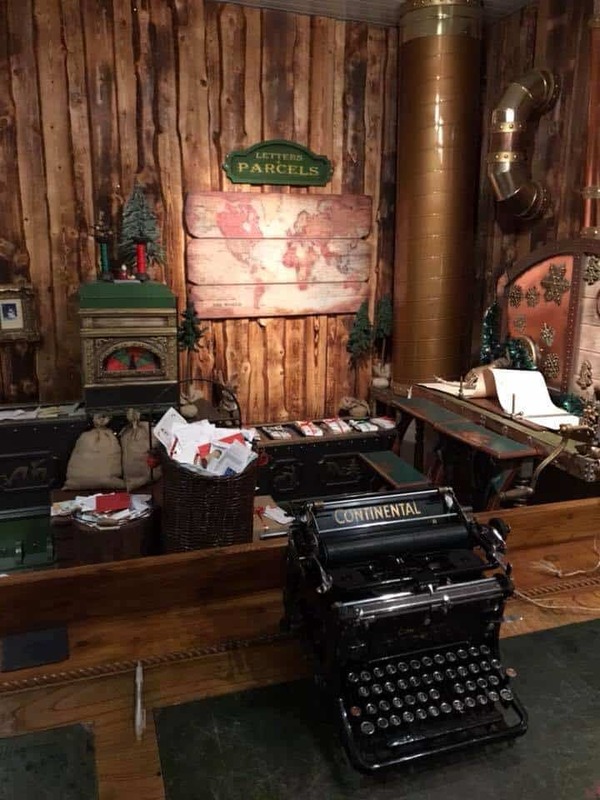 There was also an area where you could write a letter to Santa. Great for older kids. Elf Show: We decided to time a show with our buffet lunch. Show up 20 minutes before, grab some food and a table. We thought the elf show was excellent. It was a mix of silly elf, acrobatics, and storyline. Elf Workshop: The activity varies, but the day we went, the kids were able to make an ornament. There were plenty of elves on hand to help the kids, plus examples hanging on the walls. At 3 years old, our son didn’t last very long, but I am sure children that are more art inclined would really love this activity. 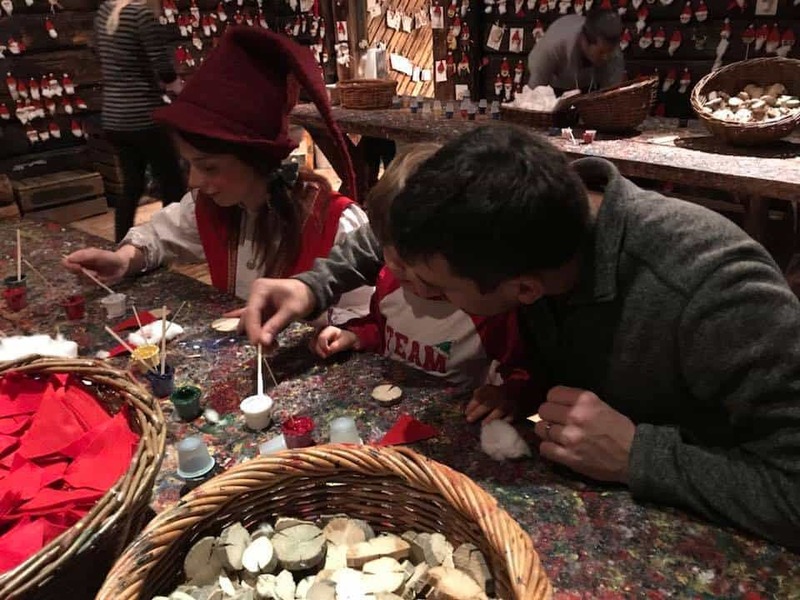 Making an ornament with dad and the help of an elf. 6. Mrs. Gingerbread Bakery: You can pre-purchase cookies or buy them when you arrive. We purchased two cookies. Show them your ticket and they will give you the cookie. The tables have the icing, decorations and clean up supplies. The cookie didn’t last long before it was devoured. 7. Ice Gallery: This was a quick venture. We put on the fluffy coats that were provided (since we had stored ours in the coat room at the entrance). 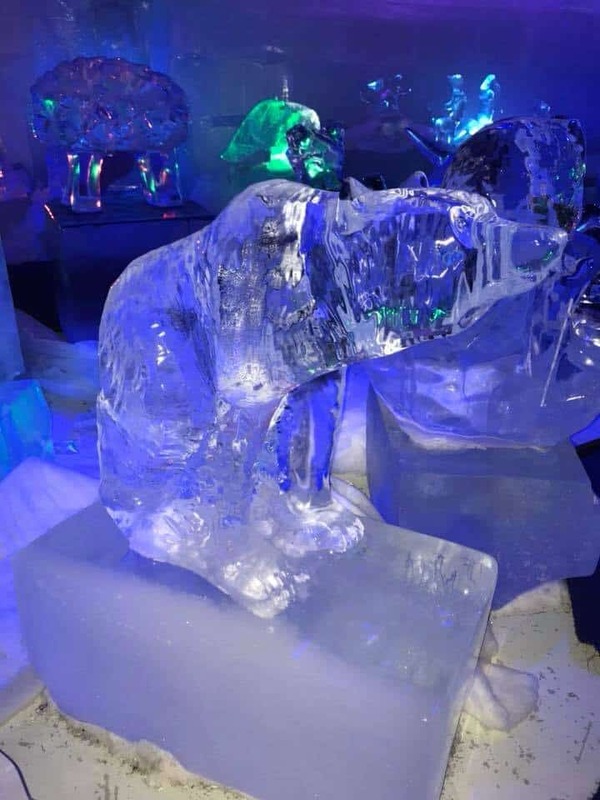 There were some very nice carved animals and an ice throne for photo ops. You can also order liquor drinks in ice glasses (if you choose). 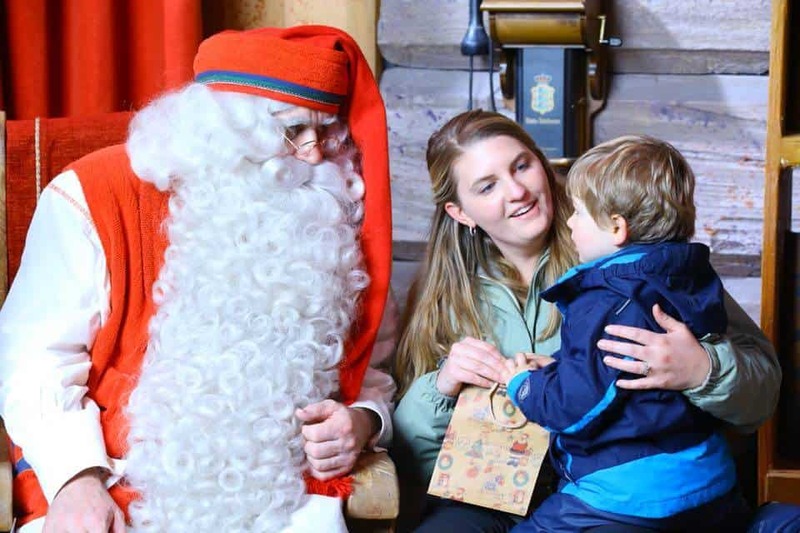 Santa Park is an easy day spent indoors with kids. I know our son appreciated not having to wear all of his winter gear and he really enjoyed the variety of activities inside the bunker. We thought all of the activities were well planned and of high quality. The elves were especially helpful and friendly. They would ask what your child’s name was and then if they saw them again, they would often use his name! Tips: E-mail ahead of time to ask about which day is best to visit. We had two options and when I e-mailed, they told me one of the days they have multiple reservations for tour buses. So, we chose the other day and it was relatively quiet. We also pre-purchased our tickets and activities, but you can purchase them at the window as well. Santa Park was a full day, so we headed back to the village, had dinner and headed to bed. The bonus of having a rental car is the ability to venture out of the city and away from the tourist groups. Thankfully, my husband grew up in Alaska and Oregon with plenty of snow. If you are not comfortable driving in the snow, I wouldn’t recommend getting a rental car. You can still visit the zoo by a tour group. Parking is free and plentiful, then you will head under the wooden arch and off to the building on your left. 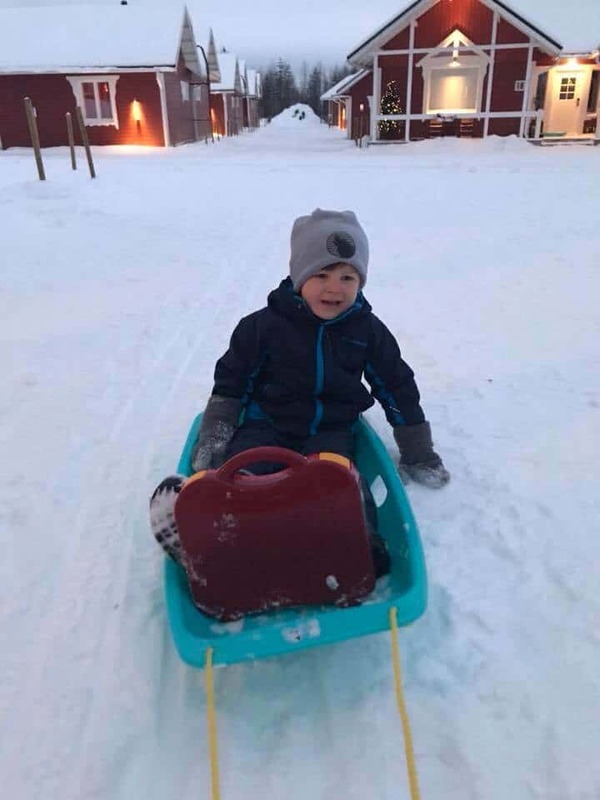 We brought the sled with us from the cottages since strollers and wagons aren’t suggested. 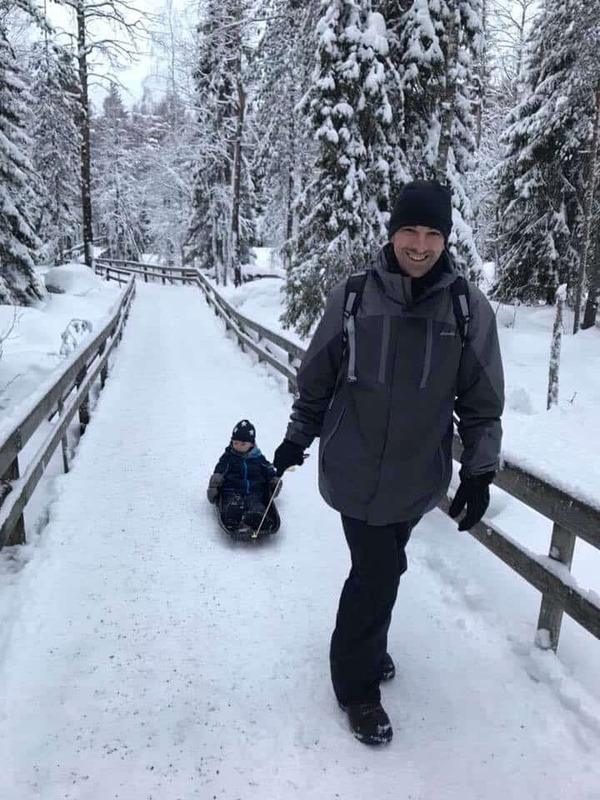 The sled worked out great, especially for the downhill walkways! If you didn’t bring a sled with you, you can rent one at the zoo. The zoo has wooden walkways and you’ll continue on a roundtrip path around the zoo to see all the animals. There are also a few fire pits and lean-to’s to warm up a bit. This was handy since my son was mostly being pulled in a sleigh and his hand got a bit cold. So I’d recommend your children walk at least a bit to stay warm. We were able to see the majority of the animals without much difficulty. 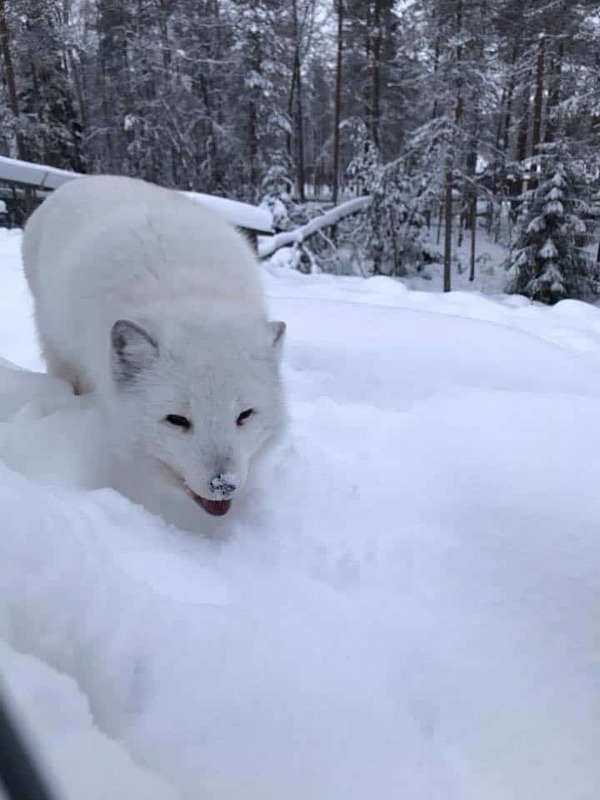 Our favorite was a white snow fox. We easily spent 2-3 hours checking out the animals, sledding down the paths and taking breaks by the fires. There are also restaurants on site for lunch. After lunch, we drove back towards the Santa Clause Holiday Village. We played in the snow again and enjoyed another dinner. This night was the best chance for the Northern Lights. See more about that post HERE. 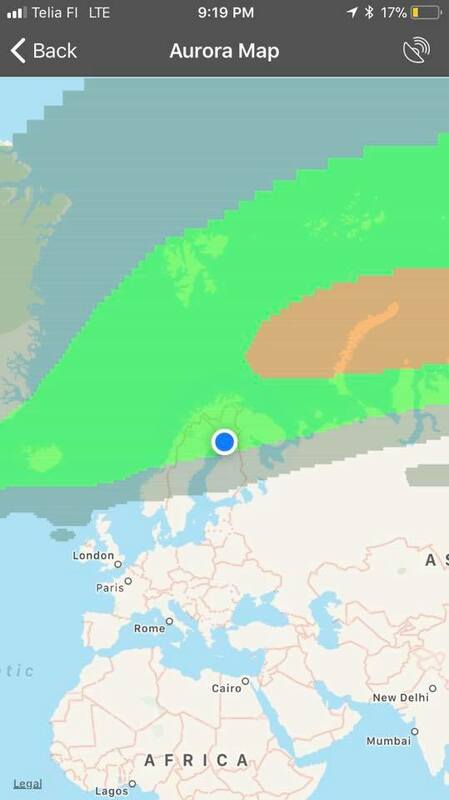 There is only a small chance of seeing the aurora borealis and Lapland is typically cloud covered. If this is something high on your list, you may want to head farther north where the elevation is often higher and you can get above the cloud level. This was the check-out day for our cottage at the Santa Claus Holiday Village. We packed up our gear and got into the car to head into Rovaniemi. This is a great location if you are looking at renting an Airbnb or you prefer hotel stays. On the plus side, you can eat where ever you choose and a rental car isn’t needed. You can book all of your tours including transportation. 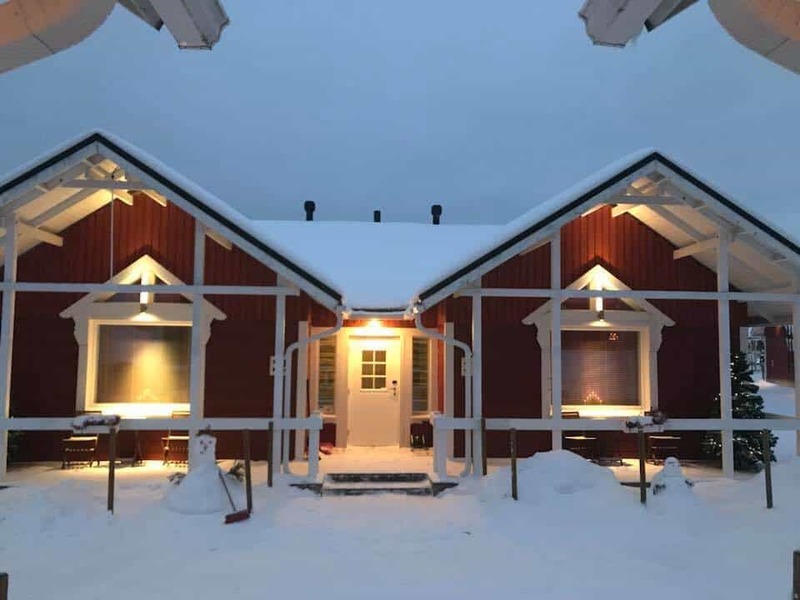 Pickups from Rovaniemi are frequent or you can walk to the office of the tour operator. Also, a great option if you are on a budget and want to eat in. There are grocery stores as well as public transportation. 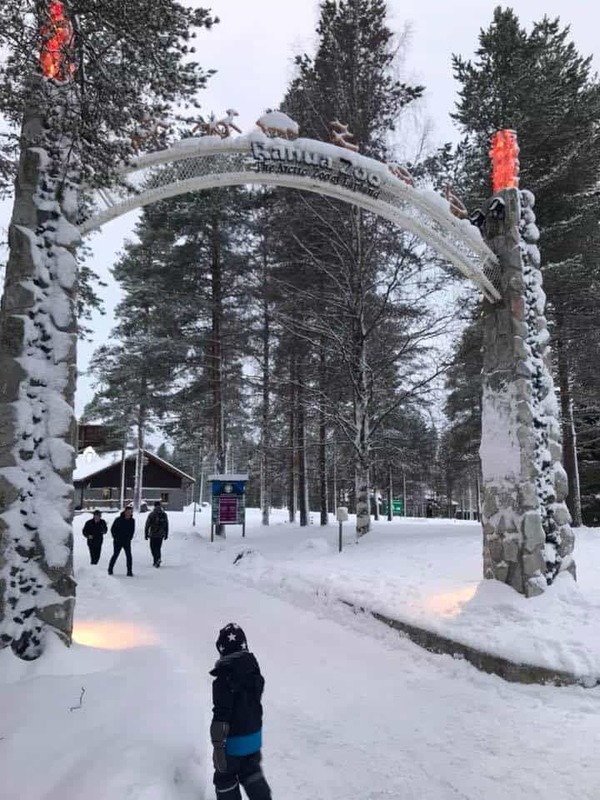 We headed into Rovaniemi to meet up with our tour operator Lapland Safaris. We picked this company because they had a family friendly husky dog sled. 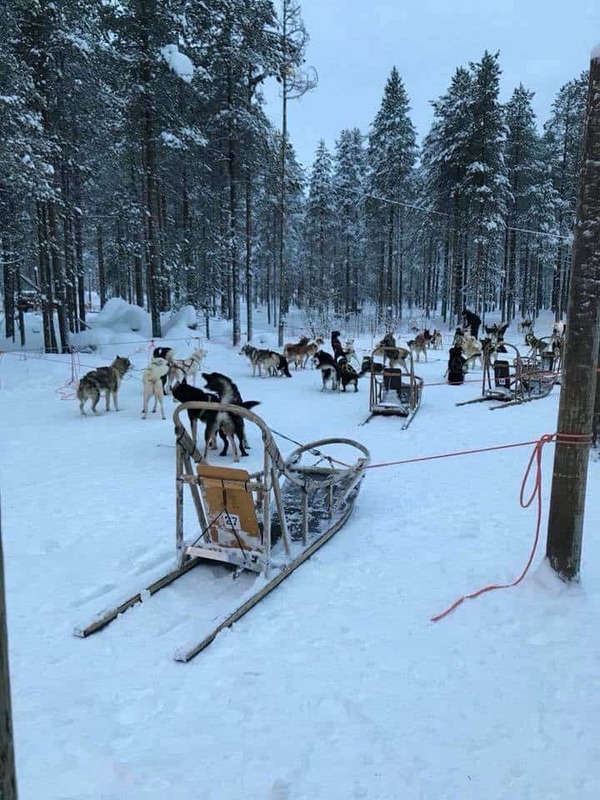 Check out our dog sled ride HERE. The tour operator returned us back to Rovaniemi and where we had some time to kill before we got onto our overnight train to Helsinki. Our next stop was the Pilke Science Centre. Parking was plentiful and free and the entrance is not too far of a walk. We brought our stroller but were told we had to park it and couldn’t take it into the exhibits, so I wouldn’t recommend bringing one unless you are walking from town. 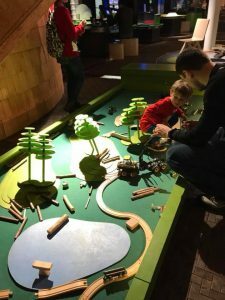 The Science Centre is super kid-friendly. The whole bottom floor is full of exhibits are interactive and fun. We enjoyed the train table, logging vehicle that you can climb into and the ATV. 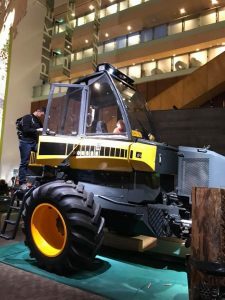 There is also a log house building zone and information about Finland’s trade and sustainability. At the end of our visit, we went out to dinner at Ravintola Roka Street Bistro. The food was amazing and I highly recommend it as a great place to eat. We were even able to sneak in our sleeping toddler in the stroller, major plus! Finally, our time in Lapland, Finland was coming to an end. Instead of flying back home, we found a cheaper flight out of Helsinki and that gave us the opportunity to take the overnight Santa Claus Express train from Rovaniemi to Helskini. It was another favorite part of the trip, so check that post out HERE. 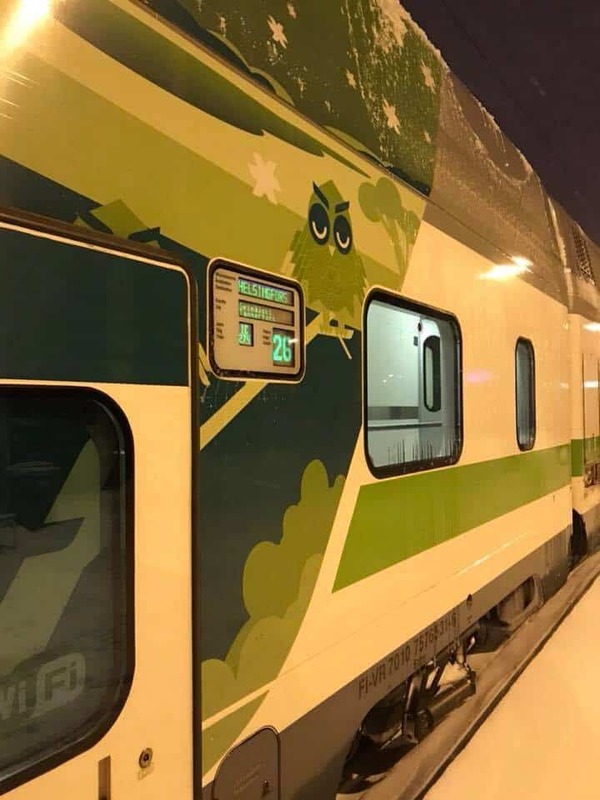 Train from Rovaniemi to Helsinki. 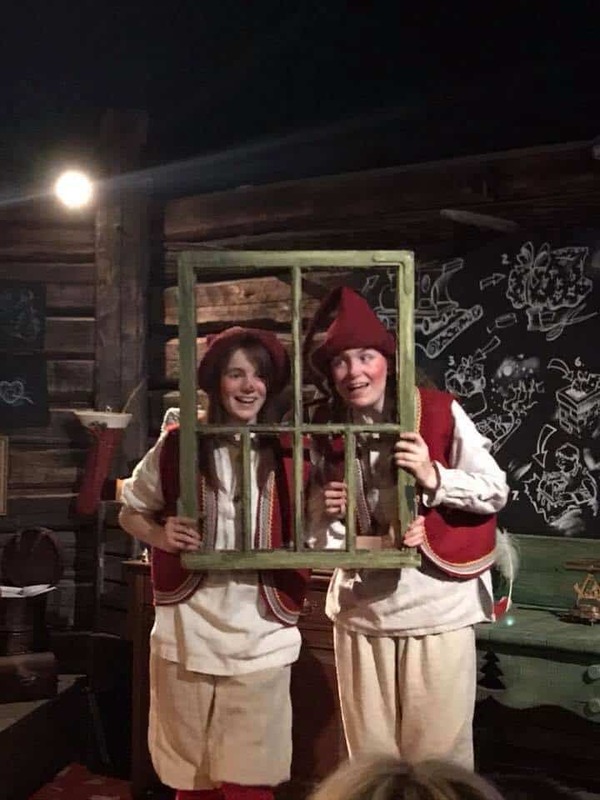 Our Lapland trip was absolutely amazing! I’m so glad that we took the trip, even with a young child. 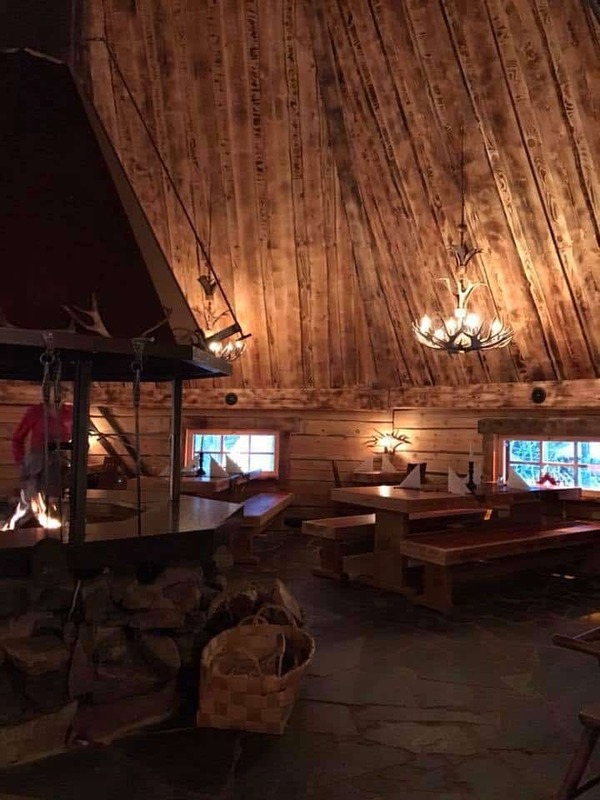 The whole atmosphere was magical and we were able to do many activities that are unique to Lapland. Not sure how to dress to stay warm? Checking out my guide to dressing your children for the winter weather HERE. Check out these products from Amazon to help make your trip to Finland a success!